Jamaica has a lot to offer families. Of course you can spend the day (or more likely, an entire week) along the white sandy beaches and teal blue waters. But there are a lot of can’t-miss adventures and excursions to be had on this tropical island — bio-luminescent lagoons, haunted houses and more! These are our picks for the best (and most unique) family excursions in Jamaica. Located in Montego Bay, the name of this beach dates back to the 1900s, when a doctor made claim to this patch of sand and in order to reach the beach, visitors had to climb through a cave. 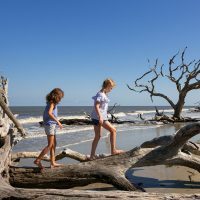 Doctor’s Cave Beach was unfortunately destroyed in a hurricane, making it much easier for beachgoers to reach the sand and surf today. The clear blue water is not to be missed. Plus, a beach bar and grill is situated nearby and chairs and umbrellas are available for rent. This natural, nighttime light show takes place on the water and is like nothing your family has experienced before. As the boat tour floats along the lagoon, it disturbs a microscopic organism in the water, which makes the water light up naturally. This phenomenon only takes place in a few lagoons around the world! The Glistening Waters Luminous Lagoon Tour lasts about 40 minutes and the whole family will be amazed on this Jamaica excursion. Located in Montego Bay, this 1770 former plantation is said to be haunted. The mistress who once lived there is said to have killed her husbands and lovers in the great mansion. Today, tours of the Rose Hall Great House and gardens are offered, including a nighttime tour, which your teens may enjoy the most. Located in Montego Bay, this working coffee and pineapple plantation offers guided tours to visitors. Families can learn about the Jamaican culture while also enjoying sugarcane, pineapple and coffee samples throughout the tour of Croydon Plantation. 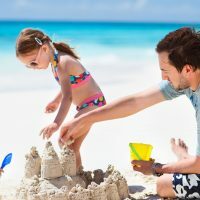 Lunch and transportation from many of the Montego Bay resorts is included in this family-friendly Jamaica excursion. Families who are seeking adventure, but want a variety of adventures from which to choose, will love the Rainforest Bobsled Jamaica at Mystic Mountain. Families can “bobsled” or zip-line through the rainforest, so you have a choice of gilding through the air or staying closer to the ground on the bobsled track. OR you can do both with a combo package! There’s also the Sky Explorer for those who may want to see the awesome views without the stomach-dropping excitement. The Sky Explorer is a chairlift more than 700 feet in the air that allows visitors to move among the treetops while enjoying the view at a more leisurely pace. This popular tourist spot in Ochos Rios is truly not to be missed. 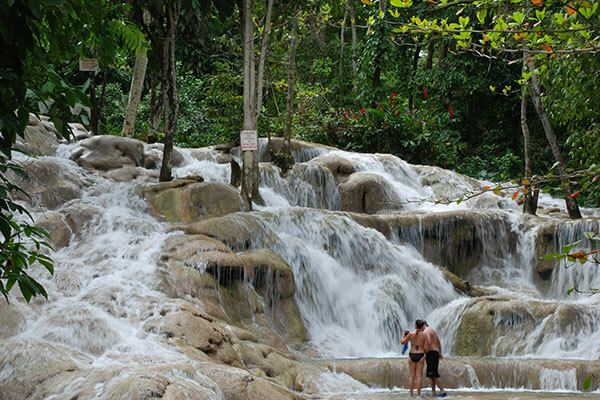 Visitors hike up Dunn’s River Falls one at a time, sort of like a human chain. This isn’t the easiest of tasks, but you’ll have plenty of laughs and helping hands while climbing! Once at the top, enjoy the view and the waterfalls. Don’t forget to wear sturdy shoes. Food is sold onsite so you will be able to fill bellies after working up an appetite. Perfect for families and large groups, this Jamaica excursion has everyone floating down the White River in Ocho Rios. The river water is cool, clear and calm, and the slow-moving current allows for easy floating in your inner tube. Chukka offers a variety of tubing excursions in Jamaica, some more adventurous than others. So be sure to decide the thrill level of the group before choosing a tour. Also, remember to bring water shoes for tubing the White River. Have you ever wanted to ride a horse on the beach and into the sea? You’ve seen the photos and we know it’s on your list of things to do when visiting paradise. Chukka Horseback Ride in Ocho Rios can make that dream come true during this Jamaica excursion. Families can saddle up and follow a guide on a leisurely ride along Papillon Cove. Your horse will soon want to take a dip in the Caribbean Sea to cool everyone off, so be ready to take that perfect Instagram shot! Families can experience all sorts of sea life at Dolphin Cove. 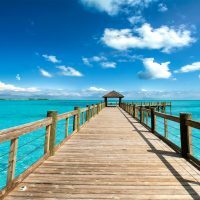 Snorkel with stingrays, watch a shark show, walk alongside iguanas and snakes and the highlight of course is swimming with the dolphins. The five-acre property in Ocho Rios is surrounded by tropical rainforest and features white sandy beaches for families to relax on, as well.